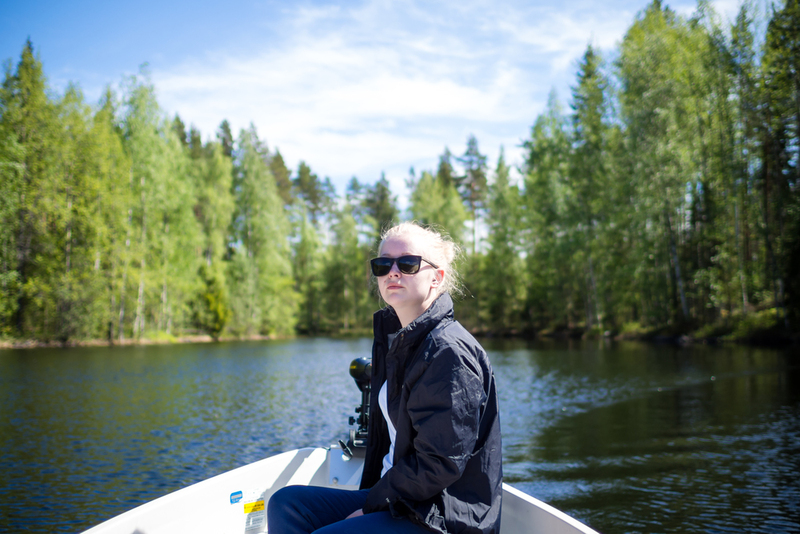 This summer we – like thousands of others Finns – traveled to our summer cabin to celebrate Midsummer. This is also the time of year when birds start to leave their nests and learn to fly. So while doing the usual yard work, we weren’t surprised to find a baby bird resting on the ground. Later during the day, we noticed that the baby bird was in a really bad shape. She was clearly not strong enough to fly, and by the looks of it, was already abandoned by her mother. Few hours later we were checking on her from afar and noticed she had wobbled to an area in our yard which is covered by ants and they had already attacked her and were about to eat her alive. As she was too weak to even move anymore, we simply could not stand by and watch this. We gently picked her up, moved her on a moss covered rock closer to her nest, and gently brushed the ants away so she could be in peace. This was when Fire saw her and, as we were brushing the last of the ants away, curled up on the rock next to her like this. I quickly took these photos of the two unlikely companions and then asked Fire to come down so that we’d leave the little bird alone. Sadly, few hours later we found her dead :( hopefully we managed to make her short life on this earth even just a little bit more enjoyable. You should never touch or interfere with a baby bird that has fallen to the ground. Even if they might seem like they are alone, their mother is usually around and your actions might cause them to abandon the little bird. In this instance, as soon as our parents noticed the baby bird, we notified everyone and actively avoided the area where she was last seen as much as we possibly could. We only intervened as we saw her totally helpless, covered by ants. She was in such a bad condition, and by this point clearly abandoned by her mother, that we knew we couldn’t rescue her but also couldn’t just stand by and watch her being eaten alive. We made a judgement call that if her short life had to come to an end, it would be nicer for her to spend her last moments in peace and comfort. This isn’t always the case so, unless you know what you’re doing, it’s better not to interfere! Also, unless you really, REALLY, know how your dog is going to react, you should never allow them this close to wild animals! We’ve encountered many baby birds and other small animals by accident while hiking and I’ve seen how Fire reacts to them so I was sure he wasn’t going to harm the little bird. But while he saw a helpless animal in need of help, other dogs might see a quick and easy snack. This wasn’t staged. We avoided touching or moving the bird as much as possible. Fire curled up this close to her on his own and was clearly protective of her. From the past three weekends we've spend two on our summer cabin. 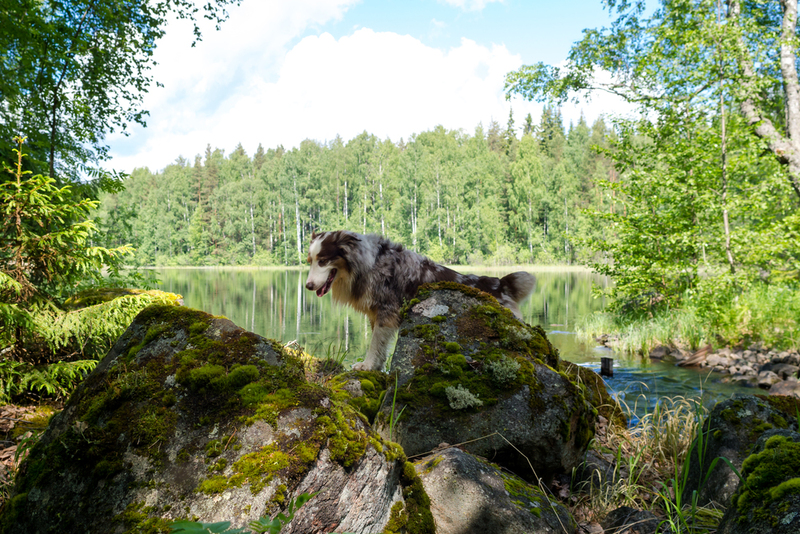 I really love going there to spend some time with the family, hiking in the woods, enjoying the lake and just being outside. And it doesn't hurt that we always try to make something nice on the grill. Here are some photos from the past two visits. Mads taking charge of the boat while I focus on taking photos. Fire enjoying the boat ride. My new Fjällräven pants. Waterproofed. Mads on the way home.